In today’s economy, competition seemingly can come from anywhere. Pressure on costs is relentless, but cost advantages based on labor or materials are fleeting. Budgets are tight and most companies are striving for top-line growth. As a result, the ability to innovate effectively and repeatedly is becoming an increasingly important source of competitive advantage. But what kind of innovation? Firms often focus on product innovation, yet new product development is costly and success is uncertain — no matter how carefully you study buyer preferences. Furthermore, successful new products are quickly mimicked — often by competitors with lower cost structures, who have not had to finance progress along the production or marketing learning curves. Industries experiencing rapid change (especially in technologies, costs, regulatory regimes) present opportunities for business model innovation. Today, healthcare providers are facing new technologies, higher costs, and a radical regulatory transformation (i.e., the ACA) of the ways they are paid and for what. Hospitals, clinics, and medical practices generate growing volumes of clinical data (an asset), increasingly captured in electronic medical records, yet many of these organizations are only beginning to consider systematically governing their clinical data or developing new data-enabled revenue streams — which may require new business models. Our Healthcare Data Monetization practice can help you: establish a thorough decision process, devise a data monetization strategy, and prepare and execute the strategy — leading to new sources of revenue, and avoiding preventable risks. A good strategy will struggle without appropriate governance; governance without good strategy is just ritual; and neither is effective without the right people in a suitable structure. 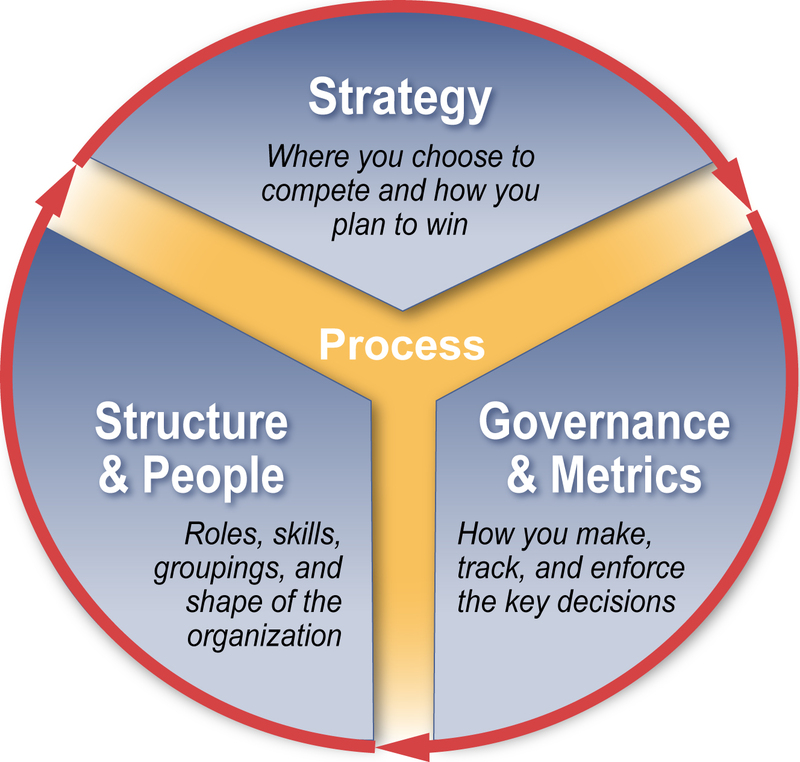 Strategy, Organizational Architecture and Governance need to be aligned for the organization to succeed. A good strategy that is poorly executed due to ineffective operating governance or an unsuitable organizational structure is likely to fail (or at least underperform). A reorganization that doesn’t take into account dynamic strategy is less likely to meet its objectives; and operating governance, to ensure the right people are making the right decisions, must take into account the organizational architecture and the strategy. Any of these elements may need to change due to new competitors, changed regulations, different input costs, new technologies, or any of the other myriad ways the business environment is continuously evolving. That doesn’t mean they all must change or that they must change together — successful companies carefully evolve as the environment changes, and we can enter in any of these practice areas to begin to make improvements. We employ distinctive techniques (such as business wargaming and organizational simulations) across all our practice areas, as well as proprietary frameworks and processes.